Shapely Boyfriend by Stefanie Japel. I've come to a bit of a standstill with this cardigan. 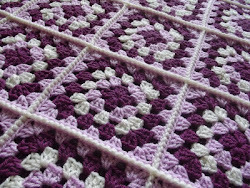 I'm trying to work a row here and there just so that work on it doesn't come to a complete halt but I've lost a bit of enthusiasm for this project. I suppose it's because it's plain knitting and a plain coloured yarn, nothing to keep me interested. 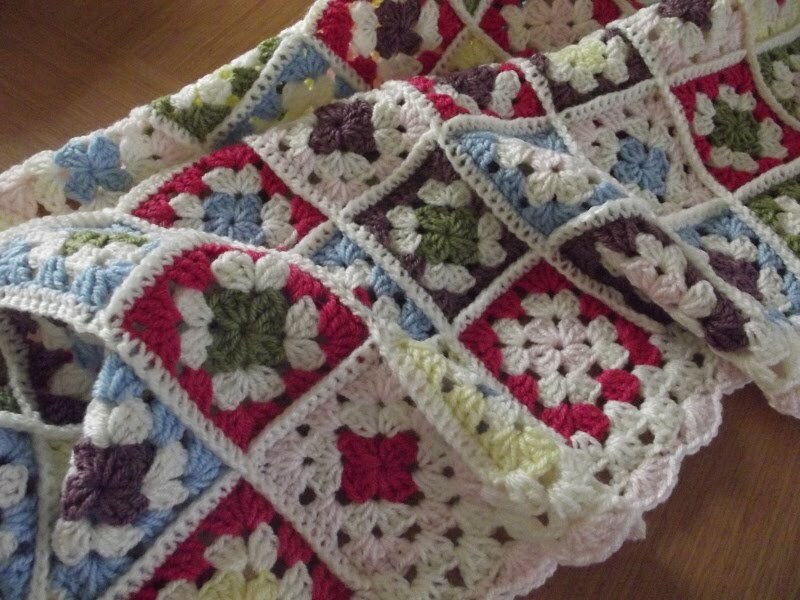 I do want the finished garment though so that's enough incentive to keep me going on it. 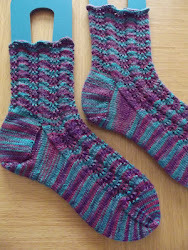 Sugar Frost Socks by Marianne Heikkinen. 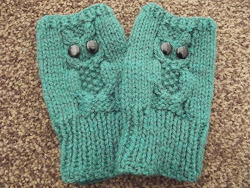 I've knit this pattern before for Eleanor and she's asked me to knit her another pair. 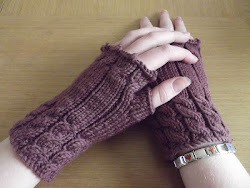 I used West Yorkshire Spinners Signature 4 ply when I knit them before and I'm using it again this time round. Eleanor chose the Blue Lagoon colourway which I had in stash and I bought the Blueberry Bonbon colourway for contrasting cuffs, heels and toes. You can see the funny way it was delivered in my Flat Pack post. I'm just on the gusset decreases on the first sock so quite a way to go yet. 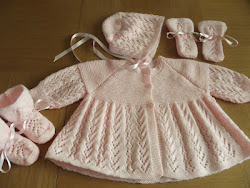 Eleanor's friend had a baby girl towards the end of last year, I knit a few things for her in the first size and now I've made a start on the 6-12 month size. I'm knitting this little jacket out of Sirdar Snuggly Crofter, which Eleanor chose before she went back to uni, and it's really living up to its name, it's very snuggly indeed. I'm loving working on this at the moment. I've already separated for the sleeves and I'm just knitting down the body. There are other things I'm waiting to cast on but I really want to make some headway on the cardigan before I do so, it's feeling a bit like a millstone around my neck at the moment. Love your choice of yarns, I'm knitting for Will, and loving the small size. 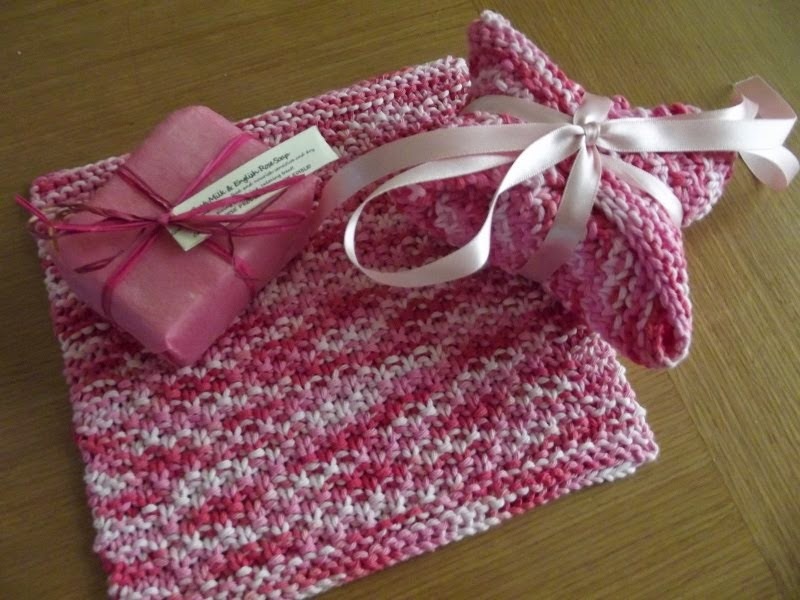 I love knitting small garments for babies and children, they seem to fly off the needles. I have a languishing jumper that I wanted so much, but it is all Stocking Stitch and boring. I no longer like the colour so once I have the strength it will be finished and donated. No socks on the needles for once, but 3 pairs in the planning. It can put you off a garment when you haven't enjoyed making it. I do still like the cardigan I'm knitting so I'll hopefully get it finished before the colder weather is over with. There's so many sock patterns I'd like to knit but I'm trying to be patient until I've got a bit further on with the cardigan. I always used to knit just one thing at once but that all changed a few years ago and now I enjoy having more than one project on the go at any one time. It enables me to work on whichever thing I'm enjoying at that time and my enthusiasm for whatever I've put to one side usually returns after a while. I didn't realise that my current projects are all for different people until you mentioned it. It is an awful feeling when you have a project which you are not enjoying. Keep with it! I'm down to the waistband on the cardigan and I know that the sleeves are looming, I think that's what's putting me off at the moment. I just need to get on with it but working on some different things for a while will probably renew my enthusiasm. loving all your projects, will have to google the cardigan pattern. The cardigan is just a plain knit, casual and something which will go with lots of things. 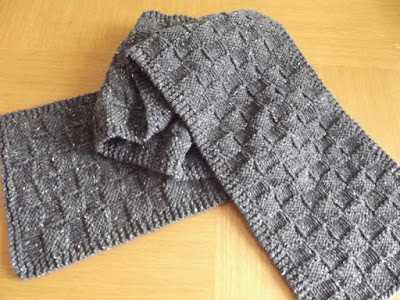 The pattern is free on Ravelry. It's a long time since there's been a baby to knit for so I'm enjoying knitting all the tiny little things. 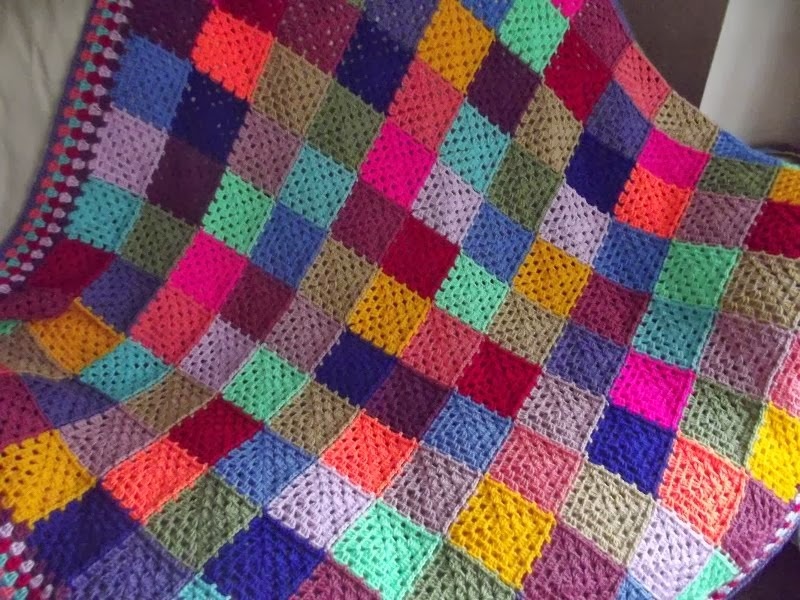 Well done on all your knitting, love the colours in the baby jacket. Eleanor wanted me to use something neutral for the baby jacket and this is what she came up with, I think it's knitting up lovely. The little cardigan is gorgeous. You can't beat a few stripes to help the knitting/crochet progress. I'm really enjoying knitting the baby cardigan, it's so cute. 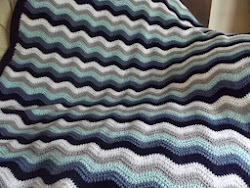 I'm a fan of stripes anyway but definitely in knitting, it adds a bit of interest, especially when knitting a plain pattern. 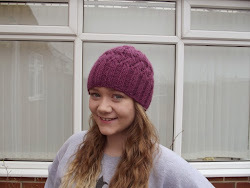 Lovely knits Jo. Just on catchup after a busy weekend with family visiting from Canberra. Have a lovely week & take care. Thank you. I hope you had a nice weekend with your family. I was laughing at Jane’s monogamous comment as I’m a crafty polygamist. The socks are ace. We were down your way on Monday/Tuesday staying at the Armouries Holiday Inn and then collecting our new motorhome on Tuesday from nearby. Straight up home and the blimmin snow never came!! If you find my mojo, I’d be grateful for its return. I’ve sorted, tidied, donated, destashec so much that I think I must have thrown it out! 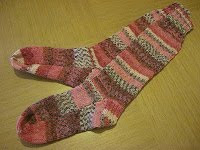 The socks are knitting up nicely, I think Eleanor will be pleased with them. The snow arrived on Friday night but it didn't hang around, it went as quickly as it came. Oh no, I'm sure your mojo will return eventually. I always find that watching a podcast or two restores my enthusiasm. I don't think Eleanor's friend has anyone else to knit for her and she's often wearing the little cardigans I've already knitted for her in many of the photos she sends Eleanor. 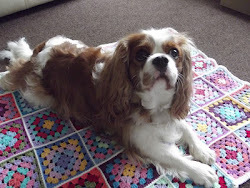 It's nice to know that the knitted garments I gift are well used. Wonderful projects my friend. Good luck with the finishes. I'm cracking on with them as there's plenty more things waiting to be cast on. I do love the baby jacket it's gorgeous. 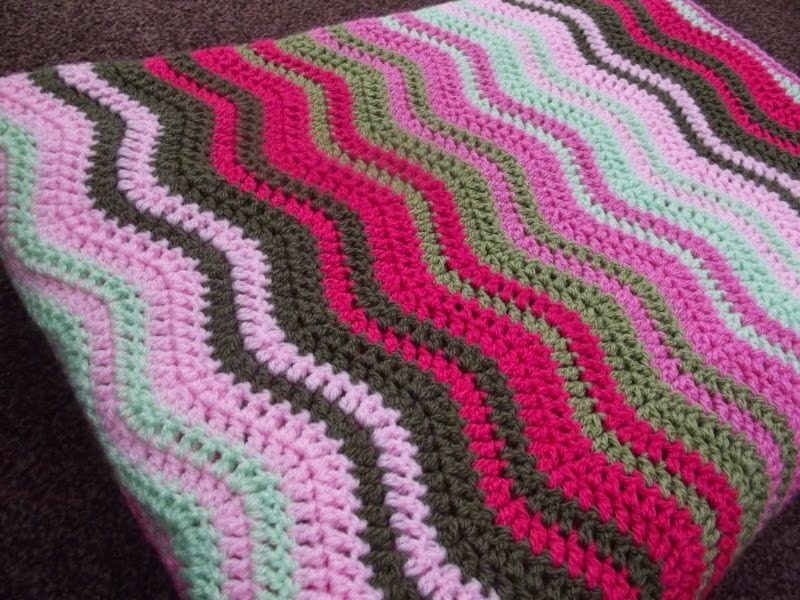 I think I'd like to buy stripey wool, it looks exciting when it knits up. I'm loving how the baby jacket is knitting up, I haven't done a baby knit in garter stitch before but it makes the garment so squishy. 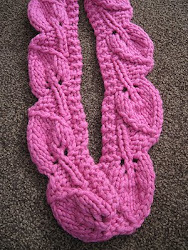 I love baby knits, they're so cute but knit up quickly too. Love the baby sweater, would like to see an adult sweater that straight forward. LOVE the socks color. Blue and green mixed has always been a favorite of mine. I understand getting tired of a particular project. Maybe pick a day of the week and on that day you work on that project. I love that the baby sweater is knit in one piece, no seaming to do at the end, and that it's just plain knitting too, I think it looks lovely. 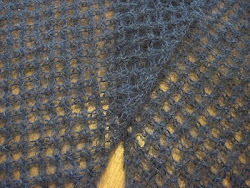 I'm knitting a few rows here and there on the cardigan at the moment but perhaps I should allocate a particular day to work on it, I'm sure it would get finished quicker that way. Wonderful assortment of items! I like having at least one rather plainish stockinette on the needles at all times as it makes for great on-the-go knitting - I need super simple so that the chances of a mistake or dropped stitch (which I'm much more likely to do when I'm not at home) are minimized. The cardigan is plain knitting but a bit too big for on the go knitting, I usually have socks for that. 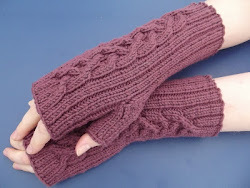 I used Snuggly yarn for some of the cardigans I knit for the grandchildren, in that same colourway you are using, it really is so lovely and soft and nice to knit with isn't it? I like the pattern on Eleanor's socks, it looks quite 'squishy'. I'm knitting The Bulky One sweater in a very similar colour to your cardigan and that's just plain knitting too, once I pick it up and get going it's ok, just doesn't seem to grow very fast, great tv knitting though. I'm really impressed with the Sirdar Snuggly, it's so squishy and soft, perfect for babies. I think my next large garment will have to be a bit more involved to keep my interest. It grows quick enough with it being knit in an aran weight yarn but it doesn't make me want to pick it up and knit on it. I know how you feel about the cardigan. I had a jumper once, one of the few items of clothing I've ever knitted, that was just plain knitting, in the round, it took me three years, and then I only wore it a handful of times. Keep at it though, I'm sure you'll wear yours more than I did mine! The baby cardigan even looks snuggly. It's very sweet. I'm not really sure why I'm not loving working on the cardigan as I don't mind a bit of plain knitting when I'm watching TV. The Boxy sweater which I knit for Eleanor was knit in a 4 ply yarn so it took a lot more knitting but I never really lost interest in it. Perhaps I've just lost the enthusiasm for it at the moment and it will come back in time, we'll see. 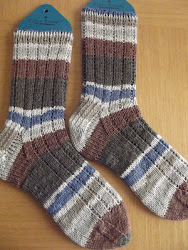 We need our woolly socks at the moment, it's turned really cold here but nowhere near as cold as it is where you are, I don't think I could cope with that. 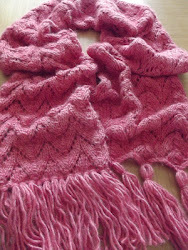 Knitting on four needles is much less complicated than people think, do give it a go, you may be pleasantly surprised. 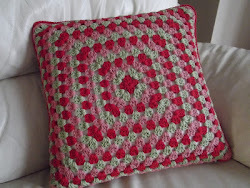 It's a long time now since I've done any crocheting, I really should pick up my hook again. The little cardigan is really sweet, nice pattern. Love the WYS socks, this colour is so lovely. I haven't knit a garment in garter stitch before but it's lovely, so squishy. I'm a big fan of West Yorkshire Spinners, they do some great colourways.